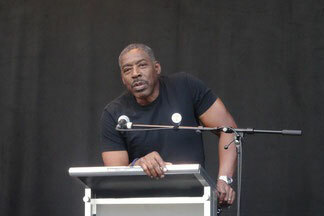 Yeaaayyy...Ernie Hudson is coming to Dutch Comic Con and in honour of this great actor we will post a lot of Ernie-related stuff on the website this week...because it's Ernie Hudson week on conmose.com! First of all: Who is Ernie Hudson? Ernest Lee "Ernie" Hudson was born on december 17th, 1945 in Bentmore Harbor (Michigan). He is mostly known for his role as Winston Zeddemore in the "Ghostbusters" franchise. But also for his roles as Leo Glynn in "Oz" (1997-2003) and as Police Sergeant Albrecht in "The Crow" (1994). Hudson lost his mother at a young age and was raised by his grandmother (he never knew his father). As a child he wrote stories, songs and poems, hoping one day his stories would make it to the stage. After finishing high school, Hudson joined the US Marine Corps. Due to his asthma however he was dismissed after only three months and he moved to Detroit. Here he became resident playwright at Concept East (the oldest black theatre company in the US) and he established the Actors' Ensemble Theatre for young talent. Also he enrolled and graduated Yale School of Drama. Ernie appeared in a whopping amount of 219 movie- and tv productions. His best role in my opinion, is his role as "Warden Leo Glynn" on HBO's "OZ". His son, Ernie Hudson JR., co-starred with him as muslim inmate Hamid Khan. Oz is the nickname of "The Oswald State Correctional Facility" ( a level 4 maximum security state prison). Most of the story is set in "Emerald City", a special unit led by unit manager Tim McManus (Terry Kinney). Emerald City is an extremely controlled unit, which emphasizes on rehabilitation and learning responsabilities. "Oz" one of my favourite series and in my opninon it's a "must watch". Ernie is great in his role as Leo Glynn, but the rest of the cast does an outstanding job as well. Ernie Hudson will be a guest at Dutch Comic Con 2016 (March 26th & March 27th in Utrecht) and in honour of this great actor this week is Ernie Hudsonweek on Conmose.